Plantar fasciitis is a very common foot injury, as about one million individuals will seek out treatment for it each year and roughly 10% of the general population will experience it at least once in their lives. The injury involves the plantar fascia, which is a strong piece of tissue that normally absorbs shock and supports the arch of the foot. Patients with plantar fasciitis typically experience a stabbing pain in the bottom of the foot near the heel, which is usually the worst with the first few steps after awakening. Recommended treatments for plantar fasciitis include a variety of stretching and strengthening exercises, bracing and a hands-on therapy called manual therapy, which is usually administered by a physical therapist. There is strong evidence showing that physical therapy-based treatments like manual therapy and exercises are effective for this injury, but it's not completely clear if patients are actually taking advantage and seeking out this type of care. For this reason, a study was conducted to investigate how many patients with plantar fasciitis are referred to physical therapy and what types of treatment those who are referred receive. 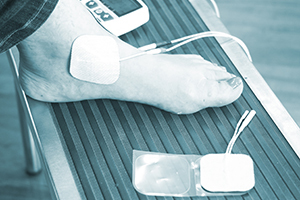 A patient record database, which contained information on patients diagnosed with plantar fasciitis and their associated health care visits, was used for the study to evaluate trends regarding physical therapy. This database provided details on 819,963 patients diagnosed with plantar fasciitis, who were billed for a total of 5,739,737 visits to a medical professional over four years. Additional data on these patients was then analyzed to determine what proportion sought out physical therapy services. Of the more than 800,000 patients in the database, only 7.1% were actually evaluated by a physical therapist within 30 days of their diagnosis. A total of 78% of the entire group of patients were between the ages of 30-59 years old, with women being 50% more likely to seek out treatment for their condition, and 85% of patients were evaluated in a private or hospital-based outpatient clinic. Of the patients evaluated by a physical therapist, 87% received manual therapy and 89.5% received supervised rehabilitation as part of their treatment program. Patients who were treated with manual therapy were found to have shorter lengths of care and paid less overall for their care than those who did not. These findings show that although physical therapy is strongly supported by evidence as a beneficial treatment for plantar fasciitis the vast majority of patients with the injury do not seek out this type of care. There are several possible explanations for this, including lack of education, financial concerns and poor geographic location, all of which can limit access to physical therapy. This highlights the need for patients to better understand why physical therapy is such a suitable intervention for plantar fasciitis, and should serve as encouragement to seek out these services if dealing with this condition. Doing so can put patients on the fastest road to recovery and save them money in the process.